When Mozilla decides to begin their Webmaker party from 15th June 2013, how can the Mozilla India community not abide by the date! 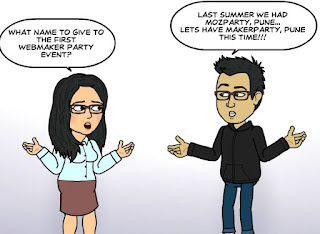 The Mozilla India community began their Webmaker party with the MakerParty, Pune. This event was aimed at introducing the Mozilla World to the fresh batch of M.Sc(CA) students in Symbiosis Institute of Computer Studies and Research who are new to the FOSS world and are taking their first steps into the Open Source Communities.The event did serve its purpose right. Symbiosis Institute of Computer Studies and Research is like the unofficial event venue for most of the FOSS events taking place in Pune. The infrastructure is provided free of cost and thus the budget is never a concern. Getting permission to use this venue is again a very easy job when the Deputy director of the college is the chairman of OSI (Open Source Initiatives). When my HOD said, he wanted me to host some FOSS event for the new batch of M.Sc(CA) on the 15th and 16th of June, I couldn't let this opportunity out of hand. 15th be it! Let the Webmaker party begin in India, the day it begins globally! 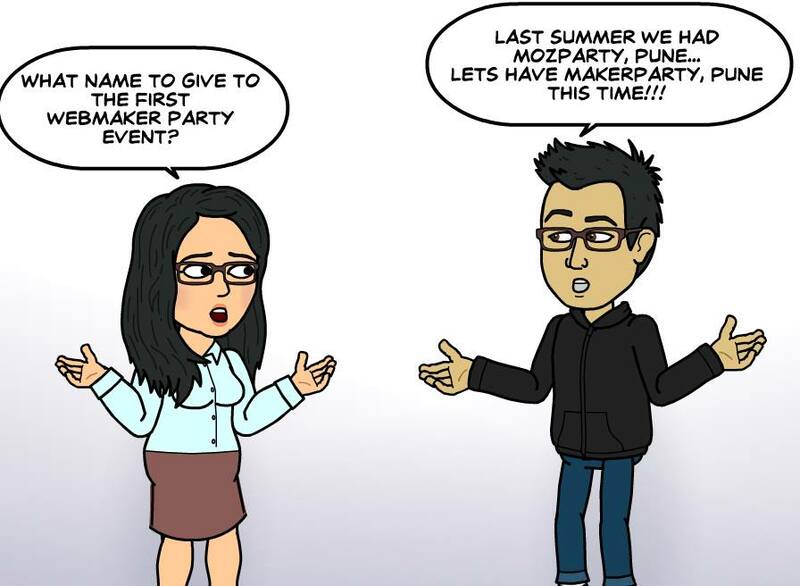 With that thought in mind, I quickly did send out invites to all the Mozillians in Pune for ideas and participations. The super charged Mozillians reacted super quick and the entire event was planned in less than one day. The super awesome part was the India community's Webmaker super mentors' remote help and contribution. Even the event was named by one of our super-mentor, Sayak Sarkar. Deciding the name of the event with Sayak Sarkar at 2.30am. We began the day with a brief introduction about Mozilla by Ankit Gadgil. The introduction was followed by a talk on Mozilla projects and initiatives whose speaker was Jai Pradeesh (our new Mozilla Rep). After Jai, I took the stage to talk about the different Mozilla products, the different ways of getting involved with Mozilla and of-course my favorite topic, WoMoz. 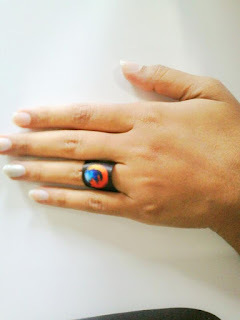 Aniket Deshpande gave a nice talk on the Mozilla Reps programme as well as the new Firefox Student Ambassador programme. Unlike the morning slot, the afternoon slots consisted of 'No talks and only hacking'. We began the session with Sayak Sarkar's motivating speech on his journey from being a Mozillian to a Mozilla Intern. He joined us through google hangout. The very fact that a SICSR student is presently interning in Mozilla got the crowed charged up to do loads of great work. After the hangout session, no more talks! The hacking began. Thimble to X-ray goggles and ending the day with pop-corn. With help and introduction on these topics by Ankit, the crowed did make some great projects by the end of the day. The work was collected in one etherpad and was evaluated by our super-mentors, Sayak Sarkar and Gauthamraj Elango. We ended the day by giving out Mozilla swags as prizes to the best makes of the day and with Sayak's promise that he will send Webmaker goodies for the best makes and submissions of the week. 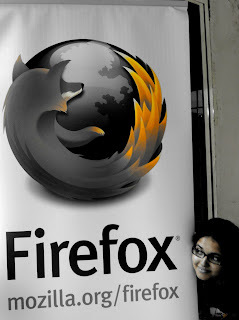 After the event, yesternight, I have got infinite calls, messages and facebook pings from my participants demanding more such Mozilla sessions in college soon! It was a great feeling to see their enthusiasm. You feel good about your work only when the you achieve your result, but in this case, the achievement was way more than I had expected.